Awning windows are an excellent addition for your home in Chicago especially if you’re looking to increase airflow without having to worry about the weather. 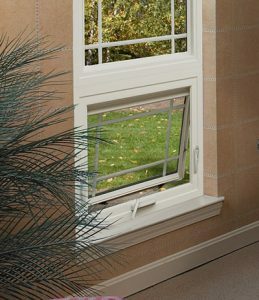 Feldco vinyl awning windows provide a functional option for your home along with clear views and improved security. Our awning windows require minimal effort to operate. 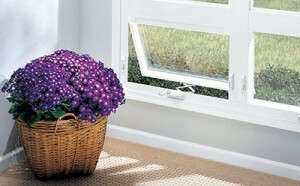 Hinged at the top, they open outward from the bottom with a crank similar to our casement windows. Since our awning windows open outward, they provide your home with protection from the elements while still allowing fresh air into your home. You can ventilate your home during rainy days to help keep humidity levels low. 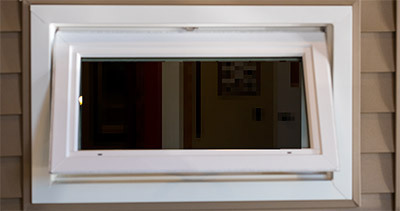 Your Feldco awning windows come with dual locks on both sides on the interior of the window. Our locking systems are fiberglass reinforced to provide maximum strength and security. The screens are located on the interior as well to help keep insects and other critters out. By choosing Feldco for your awning windows in Chicago, you’re getting the best in energy efficiency. The frames are insulated with foam to keep your home comfortable year round. The double strength 3/4″ insulated glass increases thermal efficiency and durability. Awning windows from Feldco will never rot, warp or expand because they’re made with vinyl. Gone are the days of touching up or completely repainting your windows thanks to Feldco. Also, the color you choose will be infused into the windows during manufacturing to make them look as beautiful as they did when they were first installed. Awning windows are great if you’re looking to preserve the view to the outdoors but still want air ventilation. Common places for awning windows include kitchens, bathrooms, basements and other small areas. Another popular place for awning windows is alongside picture windows or even paired with another awning window if you really want to maximize airflow.